I am super excited about today’s post!!! It just got a little cooler out yesterday and I am SOO READY FOR FALL!!! It is so hard for some people…including myself to slowly transition into the darker more jewel tones for the colder months when you just aren’t ready to put away those vibrant summer clothes!!!! In this outfit I transitioned a fun blousey top with white skinnies…..because WHO SAID YOU CAN’T WEAR WHITE AFTER LABOR DAY! ?….If there are rules in fashion…BREAK THEM because you will be the trendsetter. 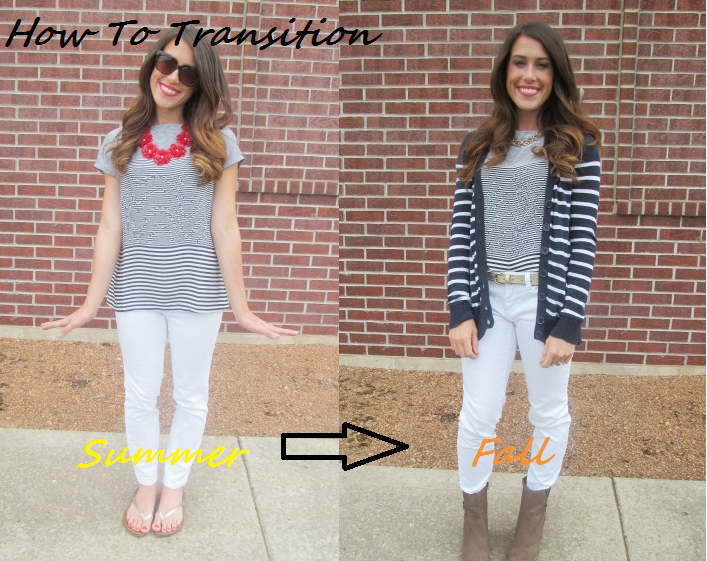 This fall keep your white skinnies out of the back of your closet and rock em!!! I paired this striped top with a striped cardi…..pulling another daring move…the stripe ON stripe! WHAT?! !…How can you pull this off you ask?? Try the same colored striped but one piece with smaller stripes and one piece with more bolder stripes!